Today we have our first guest blog post by Tania Marie. I met Tania when we were both studying Reiki from our Beloved Reiki Master Teacher, Laura Bruno. From the time I met Tania, I could feel the deep creativity and spirituality running through her. Her true essence of joy, innocence and love comes through her eyes, heart, gestures and in every word that she shares. And wait until you see her art! In the years that have since passed, my admiration for her loving spirit and her work has grown in phenomenal leaps and bounds. I never, ever miss her blog posts, as they inform, delight, and inspire me every time. 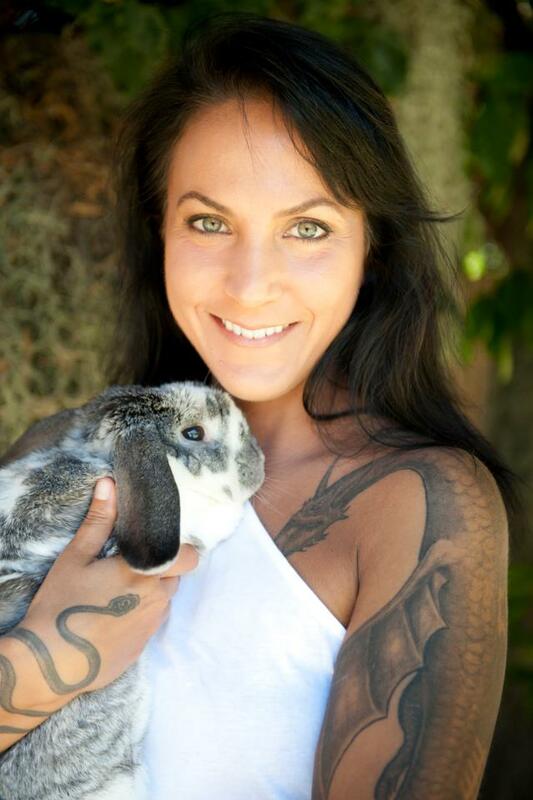 Tania Marie is a visionary artist, designer, Reiki Master Teacher, author, high raw vegan, world traveler, and owner of Emerald Bridge, a compassionately conscious business which fuses visionary services and creations. Her paintings, sacred tattoo designs, crystal pendants, articles, intuitive healing work, and heart channeled inspirations have seeded compassion, heart healing, harmony and hope to all that come in contact with them. 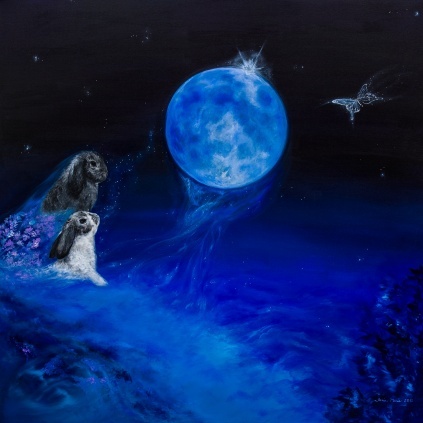 Tania passionately creates loving animal portraits, original visionary paintings, murals, sacred tattoo designs and crystal healing pendants, and she offers healing support through Reiki treatments and inspiring classes and workshops. We regularly refer clients to one another, in complete faith and trust, since she moved to Costa Mesa, California. Tania says, “My life is about transforming and shattering the old and the idea of ‘impossible,” realizing that miracles are a reality that I create. Nothing pleases me more than inspiring greatness in everyone and being inspired by the beauty in and around us all. We each have a song to sing, but together we create a beautiful symphony.” This is how Tania lives and breathes, and why so many of us are drawn to her beauty-of-the-soul and spirit. Having recently been going through another major transformation (with a physically manifested, dramatic hair cut among other things) that continues to unfold, I see this theme of renewal, integrative empowerment, inner reflection to reveal authenticity, and trust in what is revealed to manifest outwardly, to be recurring around me – whether conscious or not – embraced or not. People are going through major shifts that are like none they have gone through before. Everything is getting kicked up several notches and when we are able to recognize the beauty of it and flow with the change, rather than fight it, ignore it, or do everything else but honor it, then the magick happens. We all have different ways to go about things, different things we each have to learn, and different timing, so no one person can tell another how they “should” do something. The most important thing is to do it for yourself – whatever that soul accomplishment is that you are here fulfilling. If we see someone going through struggles, pain, or even what we may “deem” unnecessary experiences or unproductive, that is simply an observational judgement coming from not being able to see the bigger picture of free will and how each person has and will decide their own ways to learn and evolve. It can be challenging to detach and not want to step in to help in the way we think can help, but the truth of it is, we can only offer to hold an unconditionally loving space and provide energetic support. It is up to each individual what they choose in each moment and with each choice we have the ability to obtain a higher vibrational frequency, which equates to the measurement of the soul – not to our definitions of time and when and how someone must accomplish something. We all make judgments daily when we see, hear or experience things and part of our collective journey is moving towards releasing these, as we embrace the holistic concept of Oneness and mastery of our creative and loving potentials. The more we focus on our own processes and how the authenticity of that collectively connects, simultaneously, the more we start to harness the mastering of creating new realities we desire, without exerting unnecessary energies elsewhere. I am seeing how every day more and more magick keeps unfolding, the more I go to the depths within to access and embody my truth. This weekend, just after getting my hair cut, I had a very intense experience of that renewing energy, and on that journey I was led to discover a falcon feather. I now have this powerful animal totem symbolism and spirit guide energy/wisdom on my desk with me and am grateful for its gift. “The trickiest part of using the mirror process is learning how to interpret the reflection you see…It will not help to analyze and think about it with your rational mind. It is far more effective to turn to your inner self, to ask the universe for help…As you tune into your gut feeling and get a sense of what feels right in the moment, act on this feeling. “After acting on the feeling, try to be aware of the external and internal feedback from your actions. The external feedback is how well things work. Do things seem to fall into place and work easily? Then you’re surely in tune with your inner guidance. If you’re struggling to do something that doesn’t happen easily, it’s a message to let go and check back in to find out what you really want to be doing. “Internal feedback will come to you as feelings. If you feel empowered, more alive, then it’s right. The ultimate key is aliveness. The more the universe moves through you, the more alive you feel. Conversely, every time you don’t follow your inner guidance you feel a loss of energy, loss of power, a sense of spiritual deadness. “In being true to yourself you will feel more alive, but you may also feel uncomfortable. This is because you are risking change! As you undergo certain changes you may experience intense emotions. Allow these emotions expression; after all, your inner voice has to move through years of accumulated unconsciousness, doubt, and fear. So simply let these feelings come up and flush through you – they are being cleaned out and healed by the light. “…The important thing is to recognize that you are really dealing with your inner fears. Affirm that you are learning to trust yourself more and more. You will be amazed to see how others immediately mirror your increasing self-trust and confidence by responding to you with trust and confidence. “If you judge and criticize yourself, others will judge and criticize you. “If you hurt yourself, others will hurt you. “If you lie to yourself, others will lie to you. “If you are irresponsible to yourself, others will be irresponsible in relation to you. “If you blame yourself, others will blame you. “If you do violence to yourself emotionally, others will do violence to you emotionally, or even physically. “If you love yourself, others will love you. “If you respect yourself, others will respect you. “If you trust yourself, others will trust you. “If you are honest with yourself, others will be honest with you. “If you are gentle and compassionate with yourself, others will treat you with compassion. “If you appreciate yourself, others will appreciate you. “If you honor yourself, others will honor you. “If you enjoy yourself, others will enjoy you. “It’s very important to realize that you may not be able to change your old patterns overnight…It takes time for ego to change its habits, so you have to watch the same lousy movie repeat itself a few times. “…Change happens not by trying to make yourself change, but by becoming conscious of what’s not working. You can then ask your higher self for help in releasing the old and bringing in the new pattern. Remember, the darkest hour is just before the dawn – change often occurs just when you’ve given up, or when you least expect it. “After we are born into the body, we forget who we really are and why we came here. We take on the “survival” consciousness of the physical world and we get lost in the world of form. We forget our spirits, believing we are just our personalities. We lose touch with our true power and feel lost and helpless. Life becomes a tremendous struggle to find meaning and satisfaction. “But the darkest hour is truly just before the dawn. When we finally give up the struggle to find fulfillment “out there,” we have nowhere to go but within. It is at this moment of total surrender that the light begins to dawn. We expect to hit bottom, but instead we fall through a trap door into a bright new world. We’ve rediscovered the world of our spirit. “…So here we have the dilemma in which we all currently find ourselves – a great discrepancy between our spirit and our form. The spirit is very powerful and creative and has a lot of things it would like to do to express itself in the physical world, but it needs to have the form as a vehicle in which to do it. The form is willing but isn’t yet able to go where the spirit wants to go. It has to be educated and transformed through the power and wisdom of the spirit. Thank you Shakti Gawain for sharing your timeless insights. This entry was posted in Conscious Evolution, Healing, Relating, Spirituality, Uncategorized and tagged Animal Wisdom, authenticity, creativity, Crystal Pendants, Evolution, Freedom of Choice, Reiki, Sacred Tattoos, Spirit, transition, Visionary Art. Bookmark the permalink. thank you dearly for sharing this and for all the heart touching words. i am so appreciative of your loving words. no words to really grasp the magnitude of gratitude and love i feel for you and for what you have expressed. we are blessed with this connection and for all that we are experiencing in life and through our friendship. i feel the same about you and all that you bring to the collective. btw, your guest blog post on my site has been a huge hit! and it has been an inspiration for others to step up as well. many new guest blogs and interviews to come. i love that we are co-creating this empowering process for everyone. xoox! I love what we are co-creating too, Tania, and I’m so happy that others are finding value in our thoughts. I’m Happy Happy too that they desire to share their wisdom. Our communities are so powerful, especially as agents of light, love and transformation. Aho! Love Love!